When I was growing up my mom always made homemade burritos and kept them in the freezer for us. They were great for lunch, a snack, or when we didn't like dinner. Now I make them for my family and they cost around 25 cents each. Because they are homemade there are no preservatives or other ingredients that I wouldn't want my family eating. I usually double the recipe so I have enough to freeze. 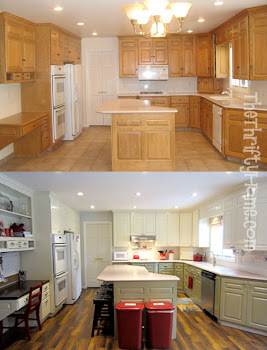 In all of the pictures below I have doubled this recipe. 1. 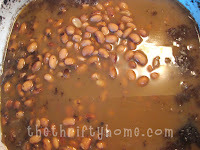 Soak 3 C. of dried pinto beans in 8 C. of water for 1 hour or overnight. 2. Add all of the other ingredients (I often omit the lard, but it does give it flavor). 3. Bring to a boil, reduce heat, cover and simmer until beans are tender. 4. Drain beans, reserving liquid. Mash beans with a potato masher (I use my Vitamix). 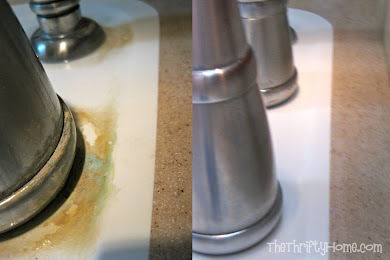 Stir in reserved cooking liquid a small amount at a time until you get a thinner consistency. 5. 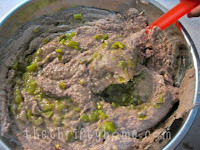 Cook 1/4 C. chopped green chili, and 1/2 C. chopped green peppers, until tender (sometimes I just use canned chiles). 6. Add to mashed beans and stir well. 7. Spread 12 flour tortillas out on the table, and grate 6 C. of cheese. 8. 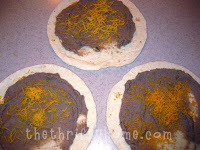 Spread the bean mixture and 1/2 C. of grated cheese on each tortilla. 9. Fold over sides in envelope fashion, and roll up tortilla, heat and serve. 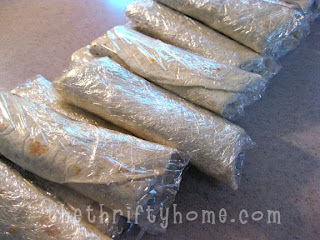 Wrap extras in plastic wrap, place in a freezer bag, and freeze for later. I usually just stick them all back into the tortilla bag. My kids love to make their own burritos and add things like tabasco sauce, salsa, sour cream, and lettuce. Note: Microwave for about 2 minutes being careful not to dry out the sides of the burrito. 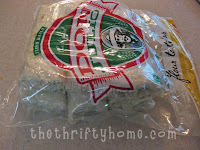 I usually keep the plastic wrap loosely on or use a damp paper towel. Click HERE for a printable version of this recpie. I love the Penny Pinching party! And thanks for the recipe - I love burritos but I usually don't make them because it's just me, but I love that I can freeze these! This is a great idea! Hubby is always hungry for a snack when he gets home from work. This would be a healthy option for him. I love homemade beans so much more than the can version! Duh. I make these beans all of the time and I have never thought to make up a bunch of burritos and freeze them. 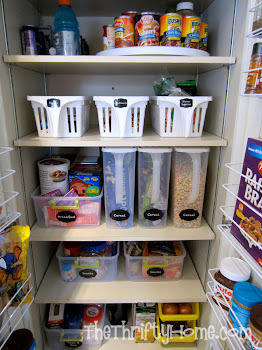 What a great idea, I think I will try it out this weekend. Thanks for the great idea!!! I love this idea, especially the freezing part. I didn't know that could be done. Thanks for posting this. Oh yum! When I scrolled down to read....and saw those burrito's...I think I heard angels! I make just about everything into a burrito. This morning......I made breakfast style. Scrambled egg, mild sausage and cheese! We were out the door with our yummy to go b-fast! Your mama ? Smart lady! Thank you for this fab idea!! One question. Do you microwave straight from the freezer or do you have to thaw first?